Read about what makes SLCS unique. Read about what makes Waldorf unique. IS the SLCS approach SIMILAR TO MONTESSORI? IS SLCS A RELIGIOUS SCHOOL? WHAT ARE THE QUALIFICATIONS OF SLCS FACULTY? DOES SLCS HAVE A SCREEN-TIME POLICY? HOW IS SLCS AND THis EDUCATION MODEL RELEVANT FOR MY CHILD TODAY? WHY DO WALDORF SCHOOLS TEACH READING SO LATE? WHAT IF MY CHILD DOESN'T GET ALONG WITH THE TEACHER? IS SLCS AN ACCREDITED WALDORF SCHOOL? 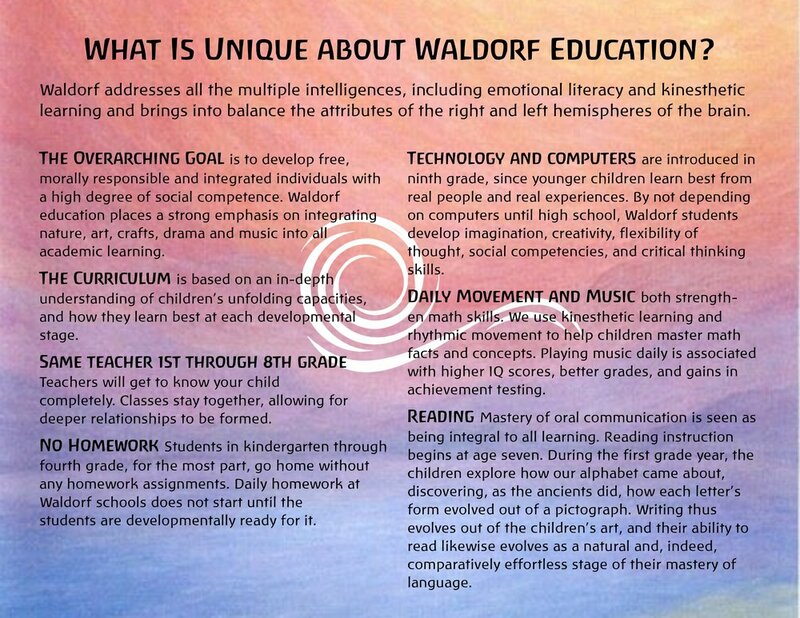 What is The WAldorf educational Approach? Developed by Rudolf Steiner in 1919, Waldorf Education is based on a developmental approach that addresses the needs of the growing child and the maturing adolescent. As a newer school SLCS is not yet an accredited Waldorf school, but our curriculum is modeled after that approach. One of the tenants of this educational model is transforming the school experience into an artful education of the whole child—the heart and the hands, as well as the head. SLCS curriculum is inspired by Waldorf Education. That approach as well as the Montessori approach began with a similar goal: to design a curriculum that was developmentally appropriate to the child and that addressed the child's need to learn in a tactile as well as an intellectual way. The philosophies are otherwise very different. Consider scheduling a short classroom visit to experience for yourself the way movement, art, and academics are woven together into a comprehensive and lively main lesson. SLCS models itself after the Waldorf approach: it is a non-sectarian, non-denominational school that compassionately educates all children regardless of their cultural or religious backgrounds. The pedagogical method is comprehensive, and as part of its task seeks to bring about recognition and understanding of world cultures and religions. The school is not part of any church and espouses no particular religious doctrine, but is based on a belief that there is a spiritual dimension to the human being and to all of life. SLCS families come from a broad spectrum of religious traditions and interests. Each faculty member must hold a bachelor's degree (preferably in education) and have either earned or be working toward earning a Waldorf teaching certificate, which is a graduate-level degree. SLCS faculty are all experienced teachers with differing backgrounds working with children, most within public educational models. All SLCS faculty members hold master's degrees in education or a teaching license in addition to their Waldorf training. What is the SLCS curriculum like? SLCS approaches all aspects of schooling in a unique and comprehensive way. The curriculum is drawn from Rudolf Steiner's indications for Waldorf schools, and meets children at their various developmental levels. Faculty are dedicated to creating a genuine inner enthusiasm for learning that is essential for educational success. Preschool and Kindergarten children learn primarily though imitation and imagination. The goal of our mixed-age Kinderfarm program is to develop a sense of wonder in the young child and reverence for all living things. This creates an eagerness for the academics that follow in the grades. Learn more about the Kindergarten curriculum here. Elementary and middle-school children learn through the guidance of a class teacher who typically stays with the class for eight years. Our interdisciplinary curriculum is rich in humanities and sciences, integrated with art, handwork, music and movement. Learn more about the grade school curriculum here. The passivity that is inherent in watching television or playing video games is increasingly recognized by educators and parents as counterproductive to the process of learning and growth in young children. SLCS follows the Waldorf educational approach, which has long been in the forefront of the movement against excessive "screen time"; other professionals now voice the same opinion. It should be stressed that at Spirit of the Lake Community School we are not opposed to electronic media but feel that electronic media are counterproductive to healthy childhood development for grade school children. Our strong recommendation, in order for your child to receive the most from the education offered by SLCS, is that there is no electronic media usage during the week, including Friday and Sunday evenings. If your family does utilize media we encourage you to limit it to Saturdays. The students carry what they have learned and experienced during the school day into their sleep and wake up ready to continue deepening this the next day. SLCS's Waldorf-trained teachers feel the appropriate age for classroom and individual computer use is in high school. It is more important for students to have the opportunity to interact with one another and with teachers in exploring the world of ideas, participating in the creative process, and developing their knowledge, skills, abilities, and inner qualities. In this way, SLCS fosters in students a love of learning, an ongoing curiosity, and an interest in life. As older students, children quickly master computer technology. how is slCs's curriculum relevant for my child today? It is easy to fall into the error of believing that education must make our children fit into society. Although we are certainly influenced by what the world brings us, the world is mainly shaped by the people living in it. That shaping is possible in a healthy way only if the shapers themselves are in possession of their full nature as human beings. Education in our materialistic, Western society focuses primarily on the intellectual aspect of the human being and has chosen largely to ignore the other parts that are essential to our well-being. These include our life of feeling (emotions, aesthetics, and social sensitivity), our willpower (the ability to get things done), and our moral nature (being clear about right and wrong). Without developing these qualities, we are incomplete—a fact that may become obvious in our later years, when a feeling of emptiness begins to set in. That is why the role of the practical and the artistic subjects is as important as the role of the traditional academic subjects the school offers. The practical and artistic are essential in achieving a preparation for life in the "real" world. Waldorf Education recognizes and honors the full range of human potentialities. It addresses the whole child by striving to awaken and ennoble all the latent capacities. The children learn to read, write, and do math; they study history, geography, and the sciences. In addition, all children learn to sing, play a musical instrument, draw, paint, model clay, carve and work with wood, speak clearly, act in a play, think independently, and work harmoniously and respectfully with others. The development of these various capacities is interrelated. For example, both boys and girls learn to knit in grade one. Acquiring this basic and enjoyable human skill helps them develop a manual dexterity, which after puberty will be transformed into an ability to think clearly and to "knit" their thoughts into a coherent whole. Preparation for life includes the development of the well-rounded person. Rudolf Steiner's Waldorf educational impulse has as its ideal a person who is knowledgeable about the world and about human history and culture, who has many varied practical and artistic abilities, who feels a deep reverence for and communion with the natural world, and who can act with initiative and in freedom in the face of economic and political pressures. Why does SLCS teach reading so late? Inspired by the Waldorf approach, most children begin reading in grade two. There is evidence that normal, healthy children who learn to read relatively late are not disadvantaged by this, but rather are able quickly to catch up with, and may overtake, children who have learned to read early. Additionally, they are much less likely to develop the "tiredness toward reading" that many children taught to read at a very early age experience later on. Instead there is lively interest in reading and learning that continues into adulthood. Some children will, out of themselves, want to learn to read at an early age. This interest can and should be met, as long as it comes in fact from the child. Early imposed formal instruction in reading can be a handicap in later years, when enthusiasm toward reading and learning may begin to falter. If reading is not pushed, a healthy child will pick it up quite quickly and easily. Some parents become anxious if their child is slow to learn to read. Eventually these same parents are overjoyed at seeing their child pick up a book and not put it down and become from that moment a voracious reader. Each child has his or her own optimal time for "taking off." Feelings of anxiety and inferiority may develop in a child who is not reading as well as her peers. Often this anxiety is picked up from parents concerned about the child's progress. It is important that parents deal with both their own and their child's apprehensions. Spirit of the Lake is registered with the State of Minnesota as an independent, private school and has been granted non-profit status by the IRS. Although our faculty either have completed or are in the process of completing their Waldorf certification and are wholly inspired by the Waldorf approach, SLCS is in the process of becoming accredited as a Waldorf school – which can take up to seven years. Teachers typically carry a class from first to eighth grade. When a teacher holds a class for years in this way, the teacher and the children come to know, understand, and value each other in a deep way. The children, feeling secure in a long-term relationship, are better able to learn. The teacher, knowing each child's strengths and weaknesses, is able to use that knowledge to create lessons. The interaction of teacher and parents also can become more deep and meaningful over time, and they can cooperate in helping the child. This question often arises because of a parent's experience of public school education. In most public schools, a teacher works with a class for one, maybe two years. It is difficult for teacher and child to develop the deep human relationship that is the basis for healthy learning when change is so frequent.